There are couple of ways to confirm/verify your SMTP settings for your SharePoint environment. 1) Add a domain user to your SharePoint site, and it lets you select the option to send a welcome email. Select that option and write your test message to verify that SharePoint is sending email to your users. 2) Create an alert for some list items or document libraries and update item and check whether your user gets an email. Sometime I use option 1 or 2 based on the user configuration. 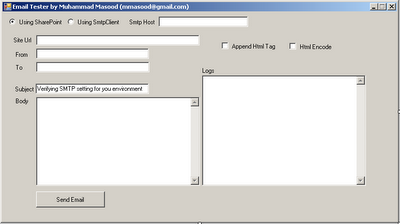 Sometime we get the user (from the client) but that user does not have email account. For that reason I use 3 option so that I can specify my own email address to verify the settings. Below is an snapshot of that application.